According to 80 percent of marketers, email marketing is known to drive the acquisition and retention of customers and supporters. But most also admitted that despite this knowledge, they often lack effective strategies for targeted messaging, email testing, or mobile optimization. As email marketing is still among the most effective and least expensive marketing strategies available to businesses and nonprofits, it’s important to observe best practices to ensure your email campaigns are as successful as possible. Avoid these 10 mistakes in your fundraising email campaigns to ensure your messaging resonates and incites action. Prospective donors don’t like surprises, like getting emails more frequently (or less frequently) than they anticipated. If you’ve ever felt hounded by a company that sends one or more new emails every day, you tend to get angry, and you become adept at hitting the delete button. Putting a first name in your subject line is a great strategy, but only if you’ve vetted the information for accuracy. Data collected on an initial subscription form can change or be incorrectly entered. Before you use a recipient’s name in your subject line, send at least one more form to verify the accuracy of the information. Your goal is to collect relevant data on your email recipients and then use that data to segment your list and send targeted messages. You can segment by demographics (such as age, marital status, or income level), or by where a recipient is in the donor giving cycle, for example, speaking to new donors and recurring donors in different manners. The best way to find out which subject lines, pieces of content, and calls to action are most effective is to run tests to see which have the best open or click-through rates. Break your list into two equal groups and send an A/B split test of your email to see which performs best. When the main topic of your email is “donate now,” you’re talking about what’s good for you, not what’s good for your supporters. Write the content of your emails from your supporter’s point of view, and seek to establish trust and an emotional connection before you try to close. Give supporters information they can use before you ask them to open their wallets for you. 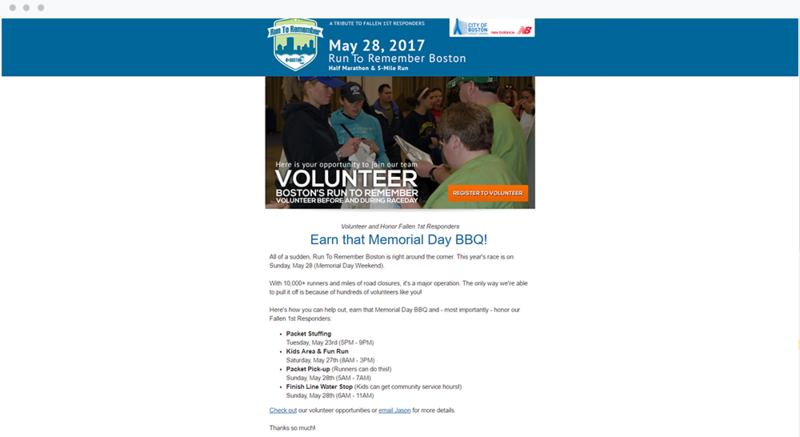 Boston’s Run To Remember focused on the Memorial Day BBQ offered to all volunteers instead of making a “hard ask” for people’s time. As a result, they had an overwhelming response for their event. That last CTA, specifically, may seem a little forward, but sometimes your readers need to be told exactly what to do. When 2012 presidential candidate, Mitt Romney, launched his iPhone app, “A Better Amercia,” or when K-Mart featured signs in its stores for “School Suplies,” they quickly hurt their credibility with their audiences. To avoid an embarrassing mistake that tarnishes your reputation, use proofreading tools like Grammarly.com and get a second (or even third) set of eyes before you hit send. Ensure recipients opt in to your emails to avoid blocks by spam filters and, in some cases, legal problems. It might be tempting to send an email to someone without permission, but it’s a flagrant violation of the CAN-SPAM act, which is a set of requirements email marketers must follow to protect the rights of consumers. If someone has not opted in to receive your email (either by subscribing on your website or providing you with their contact information) then you are legally prohibited from sending email marketing campaigns to them. You also need to give recipients the chance to unsubscribe after they’ve opted in. Make sure the option to unsubscribe is clearly visible, as this is more likely to build trust. Consultants, like BJC Branding, can help you take your email marketing to the next level. Whether you’re using Mailchimp or Constant Contact, experts can provide coaching, a new custom template, or a complete, fully-managed email service to help drive your donation dollars. Though email marketing can feel like one more item on the to-do list, it has the power to dramatically increase your donation dollars. When you avoid the mistakes mentioned above, you’ll set your messages up for success and create more valuable relationship with your supporters. Bryan Caplan helps businesses elevate their digital marketing. CEO of BJC Branding and professional speaker, Bryan travels the country, presenting on a wide range of digital marketing topics. Bryan is a guest lecturer at the Sawyer School of Business and a contributing columnist to several publications including GoDaddy, BlueHost, and Constant Contact. Bryan Caplan is a guest contributor to the Classy blog. He helps businesses elevate their digital presence.